In Japan, there are two kinds of seals: mitome-in ("personal seal") and jitsu-in ("registered seal"). A registered seal is needed to open an account in some banks or to purchase land or a car. In modern Japan most people have several seals. Men's seals are generally larger than those of women, and high-ranked executives generally have larger hanko, or seal, than their subordinates. 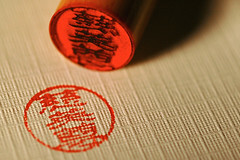 The most secure forms of hanko are used for banking and real estate dealings, while off-the-shelf varieties are used for everyday tasks such as signing for delivery of packages. Registration and certification of an inkan may be obtained in a local municipal office (e.g. city hall). There, a person receives a "certificate of seal impression" (印鑑登録証明書 inkan tōroku shōmei-sho), or certificate of authenticity, which is required for any significant business transaction, such as purchasing a car. Foreign names may be carved in rōmaji, katakana, hiragana or kanji. Inkan for standard Japanese names may be purchased prefabricated. Traditionally, inkan are engraved on the end of a stick of hard wood, bone, or ivory, with a diameter between 25 and 75 mm. Carving them is a kind of calligraphic art. Rubber stamps are unacceptable for business purposes. The first evidence of writing in Japan is a hanko dating from AD 57, made of solid gold and belonging to the Emperor. At first, only the Emperor and his most trusted vassals held hanko, as they were a symbol of the Emperor's authority. Noblemen began using their own personal hanko after 750, and samurai began using them sometime in the Middle Ages. Samurai were permitted exclusive use of red ink. After modernization began in 1870, hanko finally came into general use throughout Japanese society.